Earth observation is no longer just a way to satisfy our curiosity, but has become crucial in ensuring the survival of humankind (South Africa's Minister of Science and Technology, Mosibudi Mangena, 2007). The vulnerability of Africa to the impact of climate change, which results in natural disasters and environmental degradation, accelerates hardship and poverty for millions of Africans. However, Africa still lacks the necessary scientific and technical capacity to assess fully and to monitor the possible future impacts of climate change. One of the instruments available to address the challenges of environmental monitoring (including climate change) and to provide early warnings of natural and human-made disasters for Africa's development is Earth observation satellites. Earth observation satellites record Earth's information from space and provide accurate, continuous, simultaneous measurements of our planet. The results of the application of Earth observation satellites have long-term social benefits which include the early detection of hurricanes and typhoons that can lead to prompt warnings for areas predicted to be affected, thus providing crucial time to implement safety measures to mitigate the effects of such disasters. Several authors concur with this position, stating that the global view from satellite observation is unmatched in its ability to capture the dynamics and variability of Earth processes. The capability to predict weather (among other things) has led Earth observation satellites to become essential to everyday applications that improve human safety and quality of life. However, despite the many benefits of the use of Earth observation satellites, it still remains a major challenge for Africa to explore the full potential of Earth observation satellites in addressing continental needs (Figure 1).1 This commentary assesses the status of Africa in regard to Earth observation satellites. 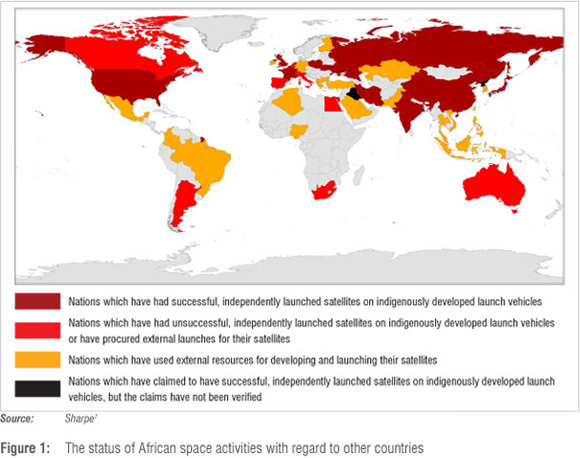 African countries are currently participating in a variety of notable space technology initiatives. We have chosen, however, to focus on Africa's role in Earth observation. Africa is regarded as both a collector and a user of data for and from the Earth observation satellites. The notable leading African countries involved in Earth observation are South Africa, Egypt, Algeria and Nigeria. South Africa's history with space science is well documented.2-6 The country's involvement in space science can be traced back to the 1950s to amateur rocket launch activities. Major activities in South Africa's participation in space science really expanded after 1994 when South Africa was democratised. The end of apartheid opened new doors for South Africa to participate more effectively towards space science initiatives. Egypt has participated in space science since the early 1900s. Through its Helwan Institute of Astronomy and Geophysics, Egypt shared the discovery of planet Pluto in the 1930s7 and participated in atmospheric aerosol studies in the 1980s. Egypt launched its first Earth observation satellite - EgyptSat-1 - in 2007. The development of EgyptSat-1 was through a working collaboration with the Ukraine. This collaboration resulted in the participation of 60 Egyptian scientists and engineers in the programme. EgyptSat-1 is not the country's first satellite: two communication satellites - the Nilesat-101 (launched in 1998) and Nilesat-102 (launched in 2000) - were the stepping stones of Egypt's space science development. Algeria launched its first satellite, called Alsat-1, in 2002, through its space agency, Agence Spatiale Algerienne (ASAL). This satellite was designed and built by Surrey Space Technology (a British Company) with the participation of 11 Algerian specialists as part of a technological transfer programme to equip Algeria for future manufacturing of its own satellites. ASAL started a 15-year national space programme (due to run from 2006 to 2020) aimed at strengthening the country's space infrastructure and increasing the number and capabilities of its space system. Through the ASAL programme, the further development of a series of Earth observation satellites (namely Alsat-1B, Alsat-2, Alsat-3 and Alsat-4) and a communication satellite (Alcomsat-1) is planned. Nigeria established its National Space Research and Development Agency (NASRDA) in April 1999. Through NASRDA, Nigeria entered space science and launched its first Earth observation satellite, NigerianSat-1, in 2003. Similar to Alsat-1, NigerianSat-1 was built through a working collaboration with Surrey Space Technology, which trained 15 Nigerian scientists and engineers in the development and assembly of NigerianSat-1 as part of technology transfer. The success of NigerianSat-1 has led to further space programme development, namely the fabrication of the Nigerian communication satellite, NigComSat-1 (launched in 2007), and the second Earth observation satellite NigerianSat-2 (launched in 2011). 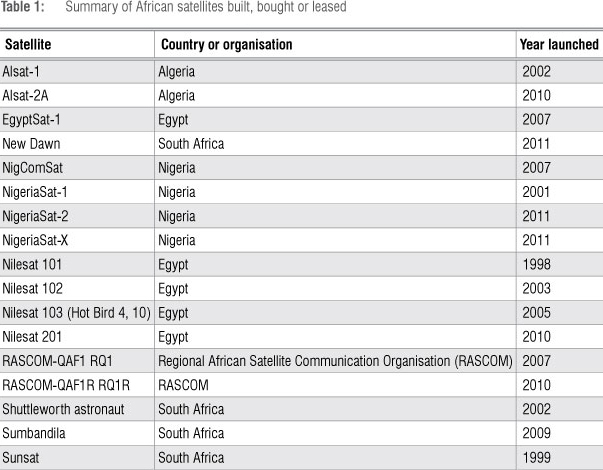 Table 1 provides a summary of African built, owned or leased satellites with most being Earth observation satellites, the remainder being communication satellites operated by the corporate sector for television and related purposes. Table 1 excludes the first French satellite, Asterix, launched from Hammaguir (Algeria) by a Diamant rocket, and nine Italian-launched satellites from their San Marco (Kenya) offshore platform using US rockets. Scientific endeavour is not purely utilitarian in its objectives and has important associated cultural and social values. It is also important to maintain a basic competence in 'flagship' sciences such as physics and astronomy for cultural reasons. Not to offer them would be to take a negative view of our future - the view that we are a second class nation, chained forever to the treadmill of feeding and clothing ourselves (South African White Paper on Science & Technology, 1996). Over half a century ago, wealthier European countries recognised that their budgets and human resources were too limited to afford the national space programmes of world powers such as the USA, Russia and, today, China and India. Alongside their national space agencies, they therefore formed a continental satellite development agency and a continental space launcher agency in 1964. These agencies were in turn merged to found the European Space Agency (ESA) in 1975. Budget constraints require even ESA to work with the USA and Russia to participate in human spaceflight and the International Space Station. The need for Africa to develop its own African Space Agency (ASA) gained momentum, and, in 2010, the African Union approved a feasibility study for the ASA. The development of this agency will enhance the contributions of other African countries towards space science. Although this initiative is seen as a positive development for Africa's contribution towards space, Peter Martinez is cited by Augustine8 as cautioning that this idea might be premature, arguing that other African countries that have not yet participated in space endeavours need first to develop their own capabilities so that they can participate fully in the development of the ASA. However, Gottschalk4 differs, stating that the development of the ASA could provide the vehicle for the continent to negotiate better offers for satellite construction, space launches, technology transfer and infrastructure, than could individual countries alone. Attesting to this, Abiodun7 stated that space exploration is a total global engagement and therefore continents ought to have one voice towards space utilisation. Thus, working on a regional basis is no longer an option, but a necessity for development. The ASA therefore needs to be implemented to enhance Africa's contribution in space science. Africa also continues its endeavours in space science with the assistance of already developed programmes, such as the European Earth Observation System called Global Monitoring for Environment and Security (GMES). The objective of this programme is to monitor natural resources (e.g. water), to give advance warning to decision-makers to counter effects of climate change, to support peacekeeping operations and to provide responses to natural and human-made disasters. Because of Africa's lack of continent-wide advances in Earth observation to address societal challenges, in 2010 the African Union asked for the implementation of GMES in Africa through its European Earth Observation Systems satellite. This collaboration will increase knowledge transfer between the two continents. The United Nations Office for Outer Space Affairs15-18 has long acknowledged that the growth of scientific knowledge and continuing development in technology are improving societal challenges, from human security to sustainable development. This office established the regional centres of space science and technology education in four regions: Asia, Africa, Latin America and the Caribbean.15 In Africa, these centres were set up in 1998 and are based in Morocco and Nigeria. The Moroccan institute serves French-speaking states and has 13 member countries: Algeria, Cameroon, Cape Verde, Central African Republic, Côte d'Ivoire, Democratic Republic of Congo, Gabon, Morocco, Mauritania, Niger, Senegal, Togo and Tunisia. The Nigerian English-based institute has 15 member countries: Cameroon, Democratic Republic of Congo, Ethiopia, Gambia, Kenya, Liberia, Malawi, Nigeria, Sierra Leone, South Africa, Sudan, Uganda, Tanzania, Zambia and Zimbabwe. This initiative equips the African continent with space science knowledge. Another international programme is the United Nations Space-based Information for Disaster Management and Emergency Response (UN-SPIDER) with regional support offices in Algeria, Nigeria and South Africa, plus the Regional Centre for Mapping of Resources in Kenya, which has, in total, 14 participating African countries. The UN-SPIDER19 aims at providing universal access to all types of space-based information and services relevant to disaster management. The African Union has further strengthened African endeavours in space science by launching the Pan-African University.20 The Pan-African University will ultimately consist of five centres across the continent, although not all have been launched yet. One of these centres will be an institute dedicated to space science which South Africa will host. The Pan-African University will increase interest in, and Africa's participation in, Earth observation. Africa's continuing participation in the development of space science will enhance the continent's ability to address vast societal challenges. 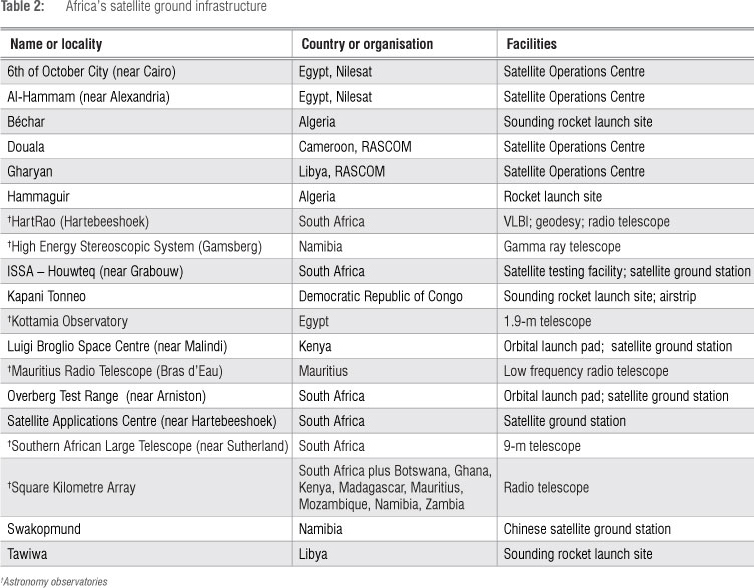 Although this commentary is focused on Earth observation satellites for assessing Africa's space participation and development, we go a step further in Table 2 to show a representative cross-section of major ground infrastructure for space-related activities in Africa. However, the remote-sensing data-processing centres for Earth observation are too numerous for inclusion in one table and are therefore omitted from Table 2. The exponential growth of scientific knowledge and the continuing development in technology improves living conditions in our society. The capacity that Earth observation satellites provide to observe possible threats to life on Earth and to help mitigate them is very important for human survival and social development. Although there is a strong need for technological advancement in Earth observation, Africa is faced with tremendous challenges in relation to such developments because of a scarcity of capital. The need to justify expenditure on space-related endeavours, such as Earth observation satellites, competes with other pressing expenditure needs, such as provision of food, houses, jobs and commercial development. It is vitally important that the African continent should have its own Earth observation satellites because if it remains a passive consumer of such satellite data bought from the market, or in the public domain, we will suffer various drawbacks. Such data are collected according to the needs and priorities of other countries or corporations, and may be subject to limitations in relation to Africa's needs. Data placed in the public domain may also be subject to significant delays and conditionalities. By contrast, an African continental consortium could, for example, negotiate with launch providers to insert a constellation of Earth observation satellites optimally spaced out into a sun-synchronous orbit, ensuring full coverage between Dakar and Djibouti. It is clear that the necessity for Africa to participate in and coordinate its space activities cannot be overemphasised, and a commitment from developed countries to assist Africa's endeavours, both financially and in knowledge transfer, is vital for the success of our continental space programmes. The authors would like to thank the Council for Geoscience and the University of the Western Cape for providing the necessary resources towards the writing of this paper.